It was not that far ago that I was listening to the previous S/V\R album, Sur Les Femmes and I was thinking just how intense their music was. Separating their previous album into two halves, the first saw them taking on their most chaotic and punishing form, rendering their soundscapes completely indecipherable. On the second part though, they seemed to let their more ambient nature surface and take us into a mesmerizing trip through their beautifully composed hypnotic moments. In Deluge though it seems like chaos prevails. It was always the case with S/V\R that they would base their structures around the rhythmic patterns that Chanoine would build. The sense of rhythm that the band brings is apparent straight from the opening of “Deluge I” signalling the beginning of the sonic assault. What starts as more or less straightforward rhythm parts, soon get twisted into something unrecognisable as the sheering distortion comes into perspective, unfolding the chaotic nature of the band in all its glory. S/V\R even toy with you in the opening track with some slight breaks from the drums, just to give them more suspense until the next brutal outbreak arrives. That is the case with both “Deluge I” and “Deluge II,” with the guys wasting no time and coming in with full force, ready to bring everything down on you. 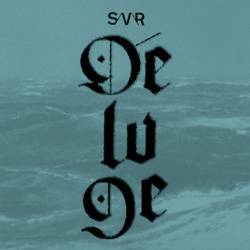 Especially “Deluge II” finds them in a whole other level or unpredictability, making a much harsher trip overall. Still there are some quite interesting moments when, some experimentation with rhythm and noise take place, as is the case with the ending of the short “Renaissance” creating a vortex where noise seems to combine with rhythm, becoming self-sustaining and giving a really cool vibe to the song. Even though the noise in Deluge is not as harsh as it is in the first part of Sur Les Femmes, it is not far off. S. de La Moth (of Menace Ruine) makes sure that the wall he is constructing is impenetrable. From the absolutely insane arrival of the analog synth torture in the opening track, the distortion does not leave you much room to breathe. The bursts of white noise in “Renaissance” create a disorienting setting with the incorporation of a more rhythmic take, and the static outlet that is produced in the closing track, “Finale” is the last push before you go over the edge. But above all, is the menace that a condensed dose of the poison can bring. In “Deluge II” the noise is causing a constant shift on the soundscapes with its destructive nature, especially in the last thirty seconds of the track, S. goes berserk in terms of harshness and creates one of the most difficult parts to listen to. In Deluge, S/V\R do not show the same, modal personification that was present in Sur Les Femmes. This release is much more focused on the anarchic and raw aspect of their sound, and leaves hidden the more ambient approach that they had presented so well in La Nuit. “Deluge I” and “Deluge II” paint a picture of utter annihilation, while the interlude “Renaissance” despite its noisy exterior, features some intriguing underlying patterns that are able to cut through the disorder. Well, no matter if they are leaning towards the ambient style, or are more erratic and unstable, S/V\R always bring out their best. Posted July 13, 2015, 8:04 p.m.
Posted July 11, 2013, 8:50 p.m.